A Look Ahead, hosted by UMBC’s College of Natural and Mathematical Sciences (CNMS) on May 3, featured posters from every CNMS department and talks by three distinguished scientists with deep ties to UMBC. The highlighted speakers included Michelle Starz-Gaiano, associate professor of biological sciences; Jeffrey Gross ’96, biological sciences, and E. Ronald Salvitti Professor of Ophthalmology at the University of Pittsburgh School of Medicine; and Ruth Lehmann, Starz-Gaiano’s mentor and Laura and Isaac Perlmutter Professor of Cell Biology at the New York University School of Medicine. 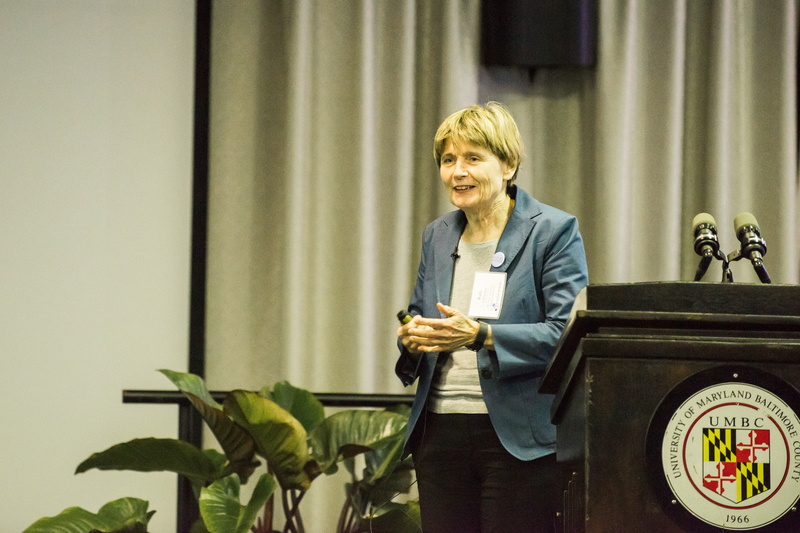 Lehmann shared how her lab seeks to understand the development of germline (sperm and egg) cells and, essentially, “what makes sperm and egg cells so special.” She has found that regulation of RNA, a molecule similar to DNA that is translated into protein inside cells, determines whether a cell develops into a germline cell or not. Her research on RNA regulation in the early embryo has challenged previous scientific understanding by finding strong evidence that “RNAs can self-localize” in the egg cell, rather than being directed by proteins. Lehmann also addressed the role of mitochondria, structures that release energy inside the cell, in germline differentiation. Her lab has identified a new role for a protein called ATP synthase, which appears to be critical for the construction of cristae, elaborate folds in the inner membranes of mitochondria. “We need the cristae as a checkpoint for the differentiation” of germ cells, Lehman says. Mitochondria are only inherited from one’s mother and can carry mutations that cause disease. Learning more about how mitochondria develop within germ cells could inform studies of those diseases. Ruth Lehmann presents her research at A Look Ahead 2017. Starz-Gaiano’s research focuses on a different aspect of early development. Her lab studies a step in early fruit fly development when a small cluster of cells migrates from one end of the egg to the other. The way these cells detach from tissue and then migrate is similar to how cancer cells metastasize, so learning more about the process could inform cancer treatments in the future. Starz-Gaiano hypothesized that small gaps between the signaling cells trapped the signal molecule, preventing it from reaching the target cells. She and her students worked with UMBC colleague Brad Peercy, professor of mathematics, to create a mathematical model of migration in the presence of gaps, and it very closely matched her data from real flies. Starz-Gaiano’s research now suggests that the gaps eventually release the trapped signal, affecting migration in surprising ways. “I think this is a really exciting result, because it’s unexpected,” Starz-Gaiano says. Jeffrey Gross ’96 presents his research at A Look Ahead 2017. Gross is also turning up compelling results in his research on age-related macular degeneration (AMD), a disease that causes blurred vision and can lead to blindness. His model organism, the zebrafish, has “a remarkable ability to recover from any injury,” Gross says, including the ability to regenerate the type of eye tissue that degenerates in AMD. At early stages of development, the zebrafish eye is similar to the human eye, and zebrafish embryos are transparent, making them easy to observe. After an eye injury, some zebrafish eye cells revert to stem cells, then develop into the cell type of the injured tissue. In humans, stem cell reversion sometimes happens, but the cells don’t re-differentiate, instead building up and making the situation worse. Gross’s goal now is to discover the pathways in zebrafish that result in successful regeneration. “That’s the big question,” he says, “What’s the mechanism underlying this response?” Once the pathway is understood in zebrafish, scientists will be that much closer to an effective therapy for AMD. Gross took a moment during his talk to thank Phyllis Robinson, professor of biological sciences, for making possible his success as a research scientist focused on vision. 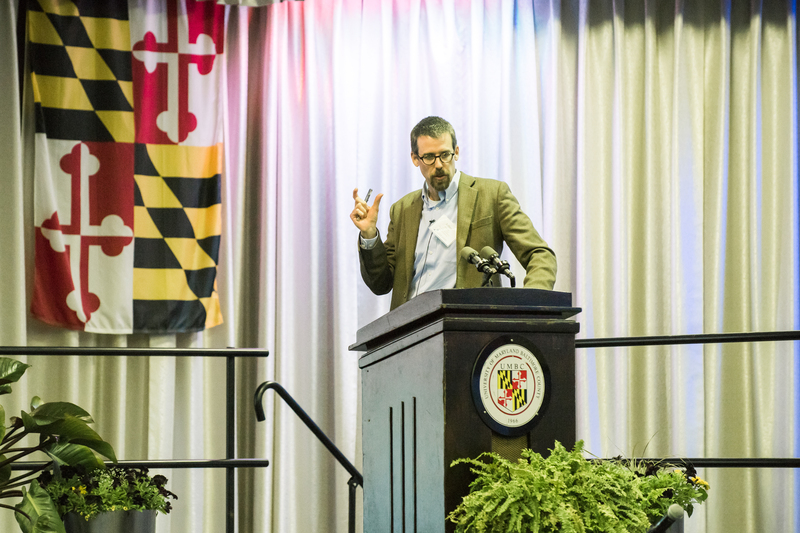 As a UMBC undergraduate, Gross wasn’t certain of his future as a scientist until he worked in Robinson’s lab. Today, he, Starz-Gaiano, and Lehmann all focus on continuing to expand opportunities for more students to participate in cell research and tap into the excitement of discovering new things about the building blocks of life. Banner image: Michelle Starz-Gaiano, biological sciences, presents her work on cell migration. All photos by Marlayna Demond ’11 for UMBC.